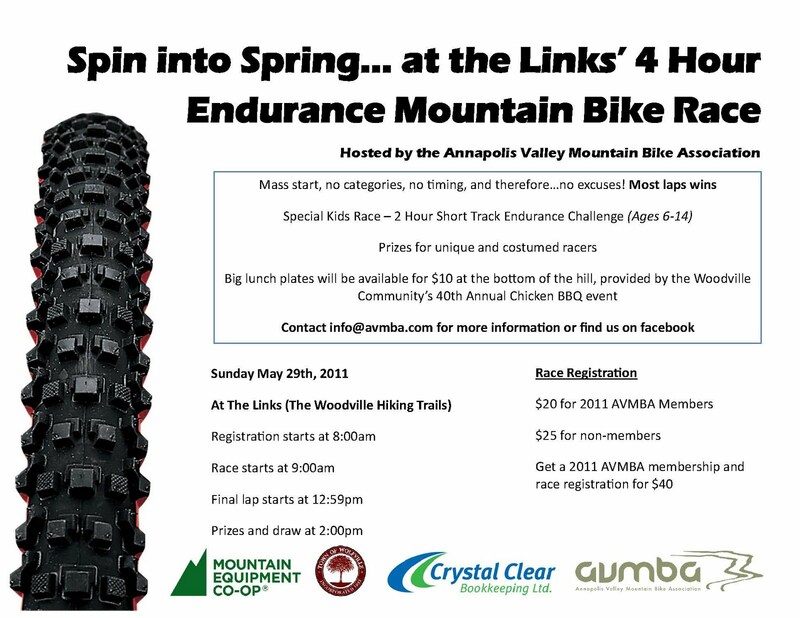 I would like to encourage all bike club participants to come out to the Links (Woodville Hiking Trails) on Sunday (May 29th) and race in the special 2 Hour Short Track Endurance Challenge (Ages 6-14) hosted by the Annapolis Valley Mountain Bike Association. It will be a wicked fun day; mass start, no categories, and no timing. The rider with the most laps wins. This is being hosted in conjunction with the Woodville Community Centre’s 40th Annual Chicken BBQ. Racers and spectators can get a big post-race meal at the bottom of the hill for $10.00 per plate. Live entertainment on site with a bounce house for the kids. A fun day in a great little community. This is a fundraiser and Membership Drive, so show up and support your local MTB club! The Valley chapter of the Trips for Kids program will be on site with leaders and bikes for kids who want to try out mountain biking. The sun was out and shinning high in the sky this past Thursday; it was a nice change from the rainy days we had been having. Water and sunscreen was a necessity! We started our ride by climbing the big hill on Orchard Avenue. We next made our way across Pleasant St. and continued our way across Skyway Drive. Everyone enjoyed riding down Kent Avenue. It was a nice break from riding uphill. We next crossed onto Cherry Lane and made our way along the crushed gravel pathway, following the train tracks back to the recreation centre. Next Thursday we will try and do more mountain bike trails if the trails dry out in time. Before starting our climb up the big hill! A group shot on a nice day! The Bike Trailor Has Arrived! Trips for Kids Annapolis Valley is proud to announce that we have received our new trailer. We would like to gratefully thank the Department of Health of Wellness and the Town of Wolfville for providing the funding that made this purchase possible. This trailer will allow the Trips for Kids Annapolis Valley program to travel with bicycles, enabling us to travel to different trail networks. The Annapolis Valley Cycling Coordinator, Michelle Marcinkiewicz poses in front of the trailer excited to put it to good use! This week at the afterschool bike club we worked on specific cycling skills. Instead of heading off on a ride, we rode down to the parking lot beside the skatepark where there was lots of room to set out some pylons and work on some particular skills. Skills that we focused on were our turning, braking, and shifting techniques. We hope that the skills we practiced will be put into use during the next couple weeks of the bike club. After working on our cycling skills while waiting for parents to pick-up we attempted at hoolahoop bicycle tires. It was very tricky... but lots of fun! TFK-Annapolis Valley is proud to announce that we have partnered with PlanetExplore, an online group that aims to get individuals and families learning and participating in events and outdoor activities in their community. PlanetExplore is enabled by The North Face who's goal is to "inspire the next generation of enthusiasts and increase outdoor participation among people of all ages." PlanetExplore’s resources will be helpful in continuing to expand our chapter. We look forward to putting PlanetExplore’s resources to use. The first session of the afterschool bike club for boys and girls happened this past Thursday at the Wolfville Recreation Center. The bike club as part of the Trips For Kids Annapolis Valley combines lessons in confidence building, achievement and environmental awareness through the development of practical cycling skills, and the simple act of having fun. It was a very successful first day complete with a ride to Reservoir Park. All participants had fun, even in the wet weather. The bike club will focus on cycling skills next session so that those skills can be applied in the future weeks to come. Trips for Kids Annapolis Valley and Wolfville Recreation is proud to announce that the Club is now at full capacity for the rest of the spring sessions. The free program is run out of the Wolfville Recreation Center every Thursday from 3:30-4:30pm until June 23rd.